Lolabuland » NEW, completely rewritten Foundations class – now open! Ta taught me the importance of pre-obstacle work, so working on really very basic ground skills that make all the rest go way more smoothly... - so lesson 1 is all away from obstacles now. I couldn't stand people redoing sequences over&over again even when I kept saying not to do it... So now sequences are only in lesson 6, the rest are various exercises with lots of variations to make sure people are training, not pattering their dogs. What is different is the order, the emphasis and the exercises and I also added some new topics, so the transition to Xtreme Foundations should be super smooth - this class certainly doesn't lack in providing MANY challenges. And definitely covers many topics that we'll be working on! The reason why I included explanations on hands and handling is just because that's one of the frequently asked questions in every class. HOWEVER, please note that this is TRAINING, NOT handling class, so I don't mind at all if you want to use hands differently as I do! Just let me know and we'll leave your hands alone and focus on training alone!!! - Perfectly fine with me! 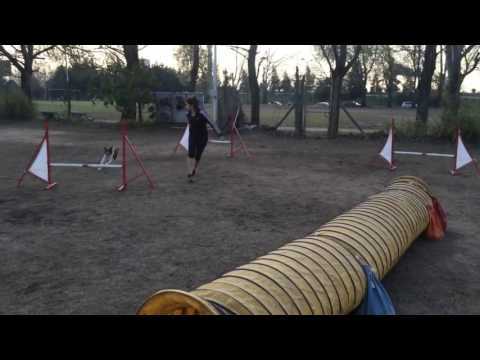 This class is appropriate for all levels, from total beginners from 7 months on - and also for experienced agility dogs - I promise to keep everybody challenged!!! All feedback completely individual. Minimum equipment needed: 2 tunnels, 4 jumps and if you want to work on see-saw and weaves as well: see-saw and stick to the ground and/or channel weaves (ideally both!). + The new Foundations DVD of course. Topics covered: play, fetching, static toys, stays, restrains, warm ups and cool downs, tight turns, sends, pushes, threadles and serpentines, come to hand, verbal discrimination, obstacle discrimination, tunnel sends, traps and turns (hard and soft turns), extension and collection, different crosses and handling, see-saw, weaves, tire, long, double and wall jump, how to choose sequences and adjust them to your dog, how to handle mistakes and more. We'll be starting with the first homework on April 2, but you can register and enter the classroom already now. Video length limitation per lesson is 10 minutes per lesson (in total that means 60 min in 12 weeks of the class). The class has 6 lessons, one every 2 weeks = 12 weeks of feedback (+ 2 weeks of a catch-up break in between). Definitely can’t wait for buying new DVD and play again with Ceres & Mad…waiting for my new puppy, of course!! !